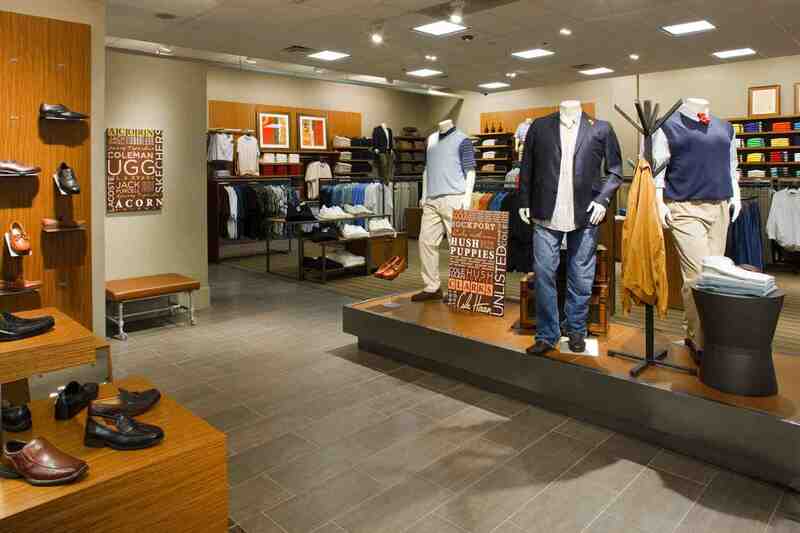 Casual Male XL is a brand and retailer of men's big and tall clothing, based out of Canton, Massachusetts, United States. It is owned by the Destination XL Group, Inc. and is sold in 440 branded retail outlets, as well as online at DestinationXL.com under its own subdomain. Other brands include the main Destination XL brand, Rochester Big & Tall, Shoes XL, and Living XL. Casual Male XL was founded in 2002 when Designs, Inc. acquired the Casual Male Big & Tall chain of stores, and rebranded them. They then oversaw an expansion, bringing in celebrities like George Foreman to endorse them. David A. Levin currently serves as CEO and the company makes over $400 million in yearly revenue. 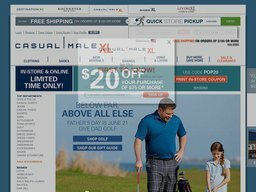 Casual Male XL provides a comprehensive selection of clothing for the tall and large man, including T-shirts, Button Shirts, Polo Shirts, Long Sleeve Tops, Jackets & Outerwear, Casual & Dress Pants (including Jeans and Chinos), Shorts, Swimwear, Sleepwear, Underwear, Golfing Clothes, and more. Shoe types include Sneakers, Casual Shoes, Boots, Dress Shoes, Sandals, Slippers, and specially designed shoes for Medical concerns. Popular brands available on the the online store include Reebok, Ralph Lauren, Levis, Nautica, Harbor Bay, Oak Hill, True Nation, Synrgy, Converse, Puma, Timberland, Vans, Wrangler, and hundreds of others. As well as clothing you can also buy items from the Home, including Furniture to support larger people, Mattresses, Fitness equipment, Aids like Step Stools, and much more. If you're looking for a bargain be sure to check out the Sale & Clearance section. Payments can be made to the website using all major credit cards, such as MasterCard, Visa, American Express, and Discover, as well as their own branded gift cards which can be redeemed for all or part of your order. Casual Male XL cater to domestic customers in the United States, and customers overseas in a wide variety of countries. You can check to see if you're served by clicking the flag icon at the top of the page. This will update your shipping options and currency, for a smooth experience. US customers have several shipping options, Standard (which can take up to 10 days and costs $10), 3 Day at $20, 2 Day at $30, Next Day at $40, and Saturday delivery at $45. All orders valued over $99 ship for free by standard delivery, but you can still pay extra for one of the faster options. International shipping is handled by the Borderfree system, the cost of which varies depending on the destination and size of the order. Adding items to your basket will give you an accurate figure. Casual Male XL operates a standard 90 day returns policy, that allows you to return most items within this timeframe for a refund or store credit, so long as they are in their original and resellable condition. All orders come shipped with the required return form and a prepaid shipping label, the cost of which will be deducted from your refund ONLY if the return comes after 90 days. @shift_in2_turbo Not at this time. We’re currently making some updates to this feature. @JoeySant81 We’d be happy to assist you. Please DM your order number and contact info.